Much of the information presented here was obtained from the book "Tales From the Trees" published in 1981 by Ailene Hayes Schneider, a Minonk native. The original settlers in Minonk were farmers from the eastern states looking for good farmland. Many of the early settlers passed right on by the Illinois prairie thinking that if the land couldn't grow trees it could not be good soil. Little did they realize that this was some of the richest farmland in the world as the result of glacier activity from million of years ago and preserved by the deep roots of the 8 foot high prairie grass. The original settlers surely were amazed at the tremendous prairie fires that occurred each year from lighting strikes during dry periods. Nevertheless, the land was cheap and plentiful and with the railroad running through the area it was relatively easy to market their crops. 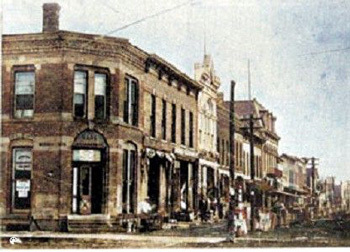 The first commercial building shown at the right was erected at the northwest corner of Fifth and Chestnut by Charles Dobson who moved to Minonk from Pattonsburg. His general store sold dry goods, nails, groceries, etc. The building is presently occupied by Leiken & Leiken law office. Lumber for these buildings was purchased in Chicago, transported by rail to LaSalle and then overland to Minonk by wagon. Mr. Dobson was also the first postmaster. One of the first families to settle in the Minonk area was the William Alvah Parks family. They came to Minonk in 1854 from New York State. The family prospered as farmers west of Minonk for many years. One of the descendants of the Parks family was Oliver Parks who was an aviation pioneer and established Parks Air Force College near East St. Louis. Mrs. Judy Kalkwarf (Parks) is a descendant of the Parks family still residing in Minonk. The first doctor in Minonk was Dr. E. A. Wilcox who came to Minonk in 1857 from Lacon, Illinois. Martha Cunningham (Eikenmeyer), a Minonk resident, is a descendant of the Wilcox family. Another of the early settlers were Sam and Joseph Wylie who arrived in 1855 from Vermont to take up farming. Descendants of the Wylie family farmed in the Minonk area until the 1960's. Thomasin Jury and her 5 children came to the east of Minonk in 1854 and purchased land for $2.50 an acre. Thomasin's husband had been killed by lightning near Low Point earlier that year. Thomasin was the first female farmer in the Minonk area and still has descendants living in Minonk. They are Adele Stalter (Dovey) and Elaine Cinnamon (Jury). Reuben Pemberton Bell came to Minonk from Virginia in 1860 and established a farm that eventually encompassed the area between East Fourth, Mary, Maple and East Sixth street. The Fieldcrest High School sets on the land formerly occupied by the Bell Farm. As late as the 1930's students could observe from the school windows the cattle grazing in the nearby pasture. Mr. Bell's daughter Sara married Bela Stoddard. Martha Cunningham(Eikenmeyer), a Minonk resident, is a descendant of this union. The Stoddard family becomes one of the most prosperous families in the Minonk area with extensive land holdings. To expedite the transportation of crops from the field to the local elevators, Stoddard built a brick road from his farms 2 miles west of Minonk into the city. This road remained intact until the late 1940's when it was paved over.